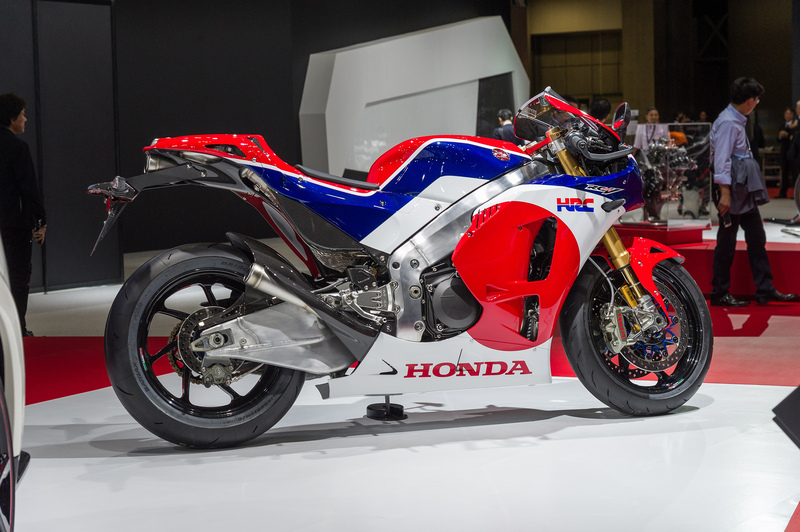 The reason they love it so much is because no lesser man than Soichiro Honda himself declared it the perfect engine for powering a motorbike (he hated two-strokes and famously compared the engine to a bamboo rod with holes in). But the reason the V4 came to be Honda’s favoured engine has a more practical origin. In the mid 1960s Honda dominated Grand Prix racing with an array of wonderful inline four-strokes. Then, having achieved their objective (of winning everything), they pulled out of bike racing, cut motorcycle R&D by 70% and concentrated on building cars for North America. Unsurprisingly, by the mid 1970s their road bike development had stalled. So the process of going Grand Prix racing to feed road development started again. The rules of GP racing had changed in the decade Honda were away. Now, you could only have four cylinders and 500cc. A two-stroke is twice as powerful per cc as a four-stroke at equivalent rpm, so as soon as you cap capacity you automatically favour two-strokes (at least, back then, when they could be as dirty as they liked). But Honda would not allow themselves to compete with a filthy stinkwheel. If only they could build a four-cylinder 1000cc four-stroke, it would be as powerful as a four-cylinder 500cc two-stroke. But the rules wouldn’t allow it. So how to get 1000cc four-stroke power from a 500cc four-stroke? You could rev it twice as hard, but you’d still need twice as many cylinders. Two problems with that: 1) the rules only allow four cylinders, and 2) if you rev an engine that hard, you have to shift a lot of fuel and air through it very, very quickly. You can’t use forced induction (turbos etc), so the only way is to give it massive valve area (the ratio between the area of the piston and the combined area of the valves). If you’re still with me, you can see where this is going – effectively, Honda needed a high-revving 500cc four-stroke with 1000cc valve area and eight cylinders. Which wasn’t allowed. Unless, of course, you actually HAD eight cylinders, but joined each pair together to make a kind of four cylinder/eight cylinder hybrid. If two combustion chambers were opened into one big one, and each ‘shared’ a piston, running eight valves per chamber and pushing on two con rods, it would have the valve area closer to eight cylinders, but would still technically be within the rules and only have four pistons. Although, admittedly, they would be oval (or, really, a ‘stretched’ circle). Bingo, you have the answer: a 500cc four-stoke, running four long, oval pistons, with eight con-rods and 32 valves. Wow! One more problem. How do you package that lot into a Grand Prix bike chassis? If you put the pistons side-by-side, like an inline four, the engine would be far too wide to fit in a bike. The only possible packaging option would be to arrange them in a V-shape, like a V8. And that is how Honda arrived at their first V4. 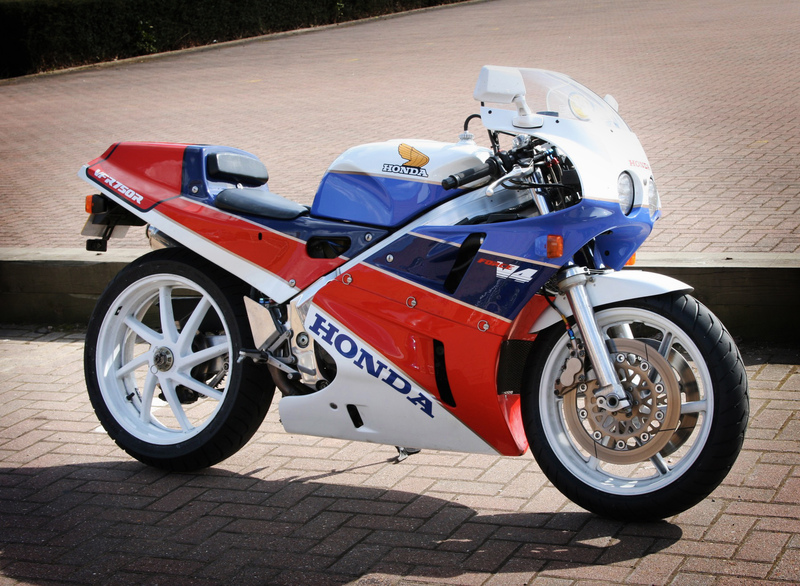 Ironically, the NR500 GP bike never won a Grand Prix, barely scored a point, and within a couple of years Honda relented, built the two-stroke NSR500 (a triple, then a V4), and Freddie, Eddie, Wayne, Mick, Alex and Valentino cleaned up. And if you really want to cause HRC pain, you could also bring up the fact the V4 in the RC30 and RC45 only won three WSB titles in 11 years. And it took Casey Stoner in 2011 to finally use a Honda V4 to win a Grand Prix championship (Nicky Hayden did it on a Honda V5). Following the launch of the new YZF-R6, Yamaha have followed up with a new ' race-ready' middleweight Supersport bike at the 2016 EICMA International Motorcycle Exhibition in Milan. ​It’s not everyday that you come across a Ducati Desmosedici, let alone one with the extremely rare and expensive GP7 kit. Vince Hosking, a keen follower of the BeMoto Facebook Page, got in touch with us asking if we could provide a quote to insure his - how could we refuse! Call BeMoto on 01733 907000 to speak to a biker about your Honda Bike Insurance with FREE Legal Expenses, NO fees to make changes and declared modifications covered.